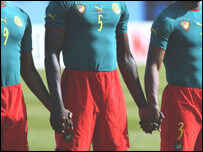 Sportswear manufacturer Puma has defended the controversial one-piece kit worn by Cameroon at the 2004 African Cup of Nations. On Friday, the Cameroon football federation Fecafoot was fined US $154,000 for using the kit while the Indomitable Lions were docked six qualifying points from their World Cup group. "We have done nothing wrong," Horst Widmann, the special assistant to Puma's chief executive, told BBC Sport. "We showed the uniforms to both Fifa and Caf, and nobody told us it was not allowed." "There was a final decision made by Caf in Tunisia, after a press conference with Mr Blatter, and again Mr Hayatou decided we could use the shirts." Widmann added that Puma representatives visited and showed the kit to Fifa deputy general secretary Jerome Champagne. The sportswear manufacturer was not told at the time that there was a problem with the strip. "It is not Puma's problem that Jerome Champagne didn't inform Blatter about that," Widmann said. "That is an internal problem for Fifa." The Puma employee also claimed that the one-piece kit does not actually contravene any of the Laws of the Game, as football's world governing body has argued. With regard to basic equipment that a footballer must wear, Law 4 of the Laws of the Game states: 'The basic equipment of a player is a jersey or shirt, shorts, stockings, shinguards, footwear'. "Nowhere in the rules is it mentioned that shirts and shorts (must be kept separate)," added Widmann. "We still have a functional shirt and functional shorts, and the only difference is that it is put together. "We cannot understand what is happening to us as you can easily solve the problem by using scissors to separate the shorts and the shirt." Football's world governing body was angered by Cameroon's decision to wear their one-piece strip in the knock-out stages of the Nations Cup despite a warning that the kit should only be worn in the group stages of the competition. On Friday, Fifa stated that Fecafoot 'had given assurances that the team would wear authorised playing kit in the knock-out phases', yet Widmann said it was not possible to supply new outfits at such short notice. "Fifa issued a warning but it impossible to produce a new uniform in Cameroon colours - with numbers and names and everything - within a few days," he claimed. The special assistant added that Puma is consulting with its lawyers and waiting to see the Fifa documents on the Cameroon sanction before making a final decision on whether to pursue legal action.